Two days ago, there was a sneak peak of the 11 stations along the Circle Line that will be open on 17 April 2010. The event was called the Circle Line Discovery. I was there with thousands of curious people, all wanting to see how the stations will look like. 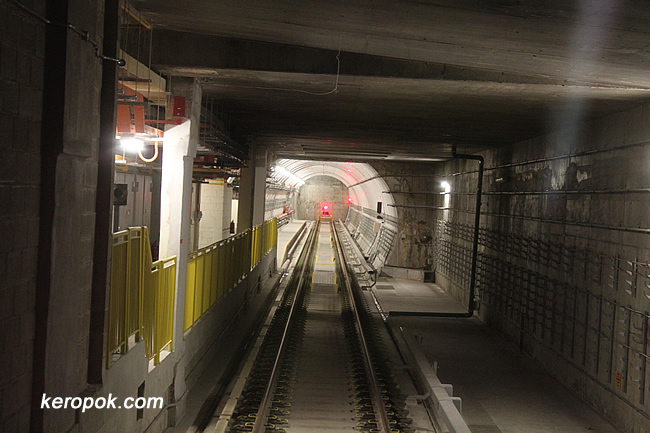 We also got to see how the tunnels looked as the tunnel lights were switched on. This photo is taken inside the first/last carriage of the train. This is at the Dhoby Ghaut station, which is the first station of the line, and it has the station code "CC1". Luckily they are driverless trains. Or we will be getting bumpy rides! LOL.. that's a good one. I guess that light will never turn green!